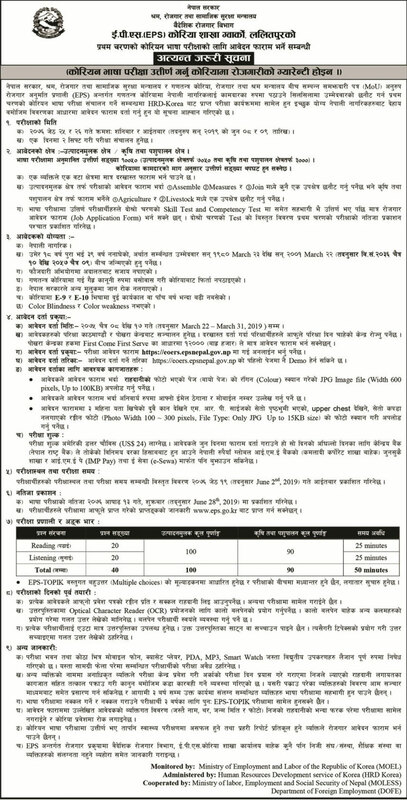 Government of Nepal, Ministry of Labor, Employment and Social Securiy, Department of Foreign Employment has published a notice for EPS-TOPIK 2019 (10th PBT).The Korean government is likely to recruit around 10,050 Nepali workers under the EPS for 2019.A first phase of the Korean language test- 2019 under the Employment Permit System (EPS) is scheduled for June this year. Nepalese candidate who have completed 18 yrs and should not exceed 39 years of age (Born within 10th Chaitra 2036 to 09 Chaitra 2057). Examination will he held in two shift. Passing this exam qualifies one to get a job in South Korea under the Employment Permit System (EPS).The examination will be conducted in Kathmandu and Pokhara, and the applicants are required to choose the exam centre (between the two) in the registration form.The applicants can fill up the registration online by visiting EPS centre’s website. Only first 12,000 applicants can apply for the test for the Pokhara centre. 2075 Jestha 25 and 26 (Saturday and Sunday) i.e. June 8 and 9, 2019. > Examination center and Time will be published on 2nd June 2019 , Sunday. It is to be noted that passing the EPS TOPIK exams only opens the door for jobs in Korea. It does not guarantee job immediately.